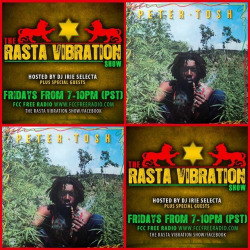 The Rasta Vibration Show is coming in hot tonight on FCCFREE RADIO!!! Joining us tonight will be the article Anthony Malvo!!! We will be discussing his brand new singles and upcoming shows, Plus we have a whole bunch of reggae music to play for you!!! Join us 7-10pm Cali time… Worldwide on www.fccfreeradio.com Live in Studio 1A!!! 3 Responses to "Get Those Spliffs Ready!!!" Great show dude! Thank you for what you do out there! Bless up Mikey! Give thanks!!! Checked your show again brother! Keep doing what you do with the talent that you have. Great shows that I enjoy!